If you're headed to Paris in July, you're in for an entertaining if overcrowded ride. While tourist season is at its peak and the city's museums and other top tourist attractions are swarming with people, locals will have left in droves of their own for the French Riviera or the Spanish coastline, making the pace around Paris unusually languorous and the mood especially exuberant. If you want to see Paris with its best postcard face put forward, visiting in July is ideal. If, however, you tend toward claustrophobia, are looking to see Paris from a more local perspective, or want to avoid paying exorbitant prices for plane tickets or hotels, steer away from high season and wait until the fall or winter to schedule your getaway. July tends to have a very laid-back feeling about it. Abandoning the indoors, locals and visitors take to the balmy outdoors, roaming the streets and flocking to public parks and Seine-side boardwalks during the sunny days and mild nights. In early July, try on that previously-inaccessible couture item or search for that rare book or antique: summer sales in Paris are on and this is the ideal time to go deal-hunting. 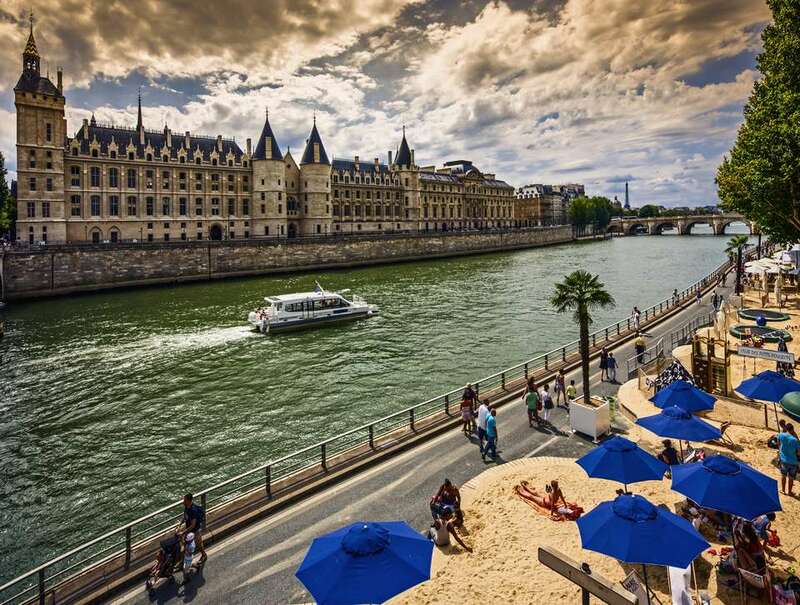 July is also an ideal time for experiencing a boat tour of the Seine or of Paris canals and waterways, especially on hot days when breezes off the water offer a welcome reprieve. Having lunch or dinner on the boat can be especially memorable. July 14: Bastille Day marks the beginning of the French revolution and the country's long, chaotic road to becoming a republic. Similar in spirit to American Independence Day or Canada Day, La Fête de la Bastille is not to be missed and offers a chance to see top-notch fireworks or organize a picnic in one of the city's lush, gorgeous parks and gardens..
July 29th: Competitors in the hotly-anticipated Tour de France bike race sweep through the finish line in Paris on the Avenue des Champs Elysées. Open-air Cinema at the Parc de la Villette: Enjoy movies on a summer night, maybe accompanied by a picnic? This is the event for you-- and all the screenings are free! Starting July 19th, 2018, get out there and see a few films while you soak up some fresh air. If so, start looking for travel packages and lock in a good deal for your July sojourn by visiting sites like TripAdvisor (book direct). If you're looking for accommodations that match your needs and budget, you can read reviews, find deals, and compare prices on hundreds of hotels (also at Trip Advisor). Weather Outlook, and What to Pack in July? Wondering what to put in your suitcase ahead of your trip? The information below should help you get ready. How to Pack and Prepare for a July Trip? July in Paris is generally cool to pleasantly balmy, with average temperatures at around 66 degrees F. In recent years, however, major heatwaves have occasionally struck, particularly in late July, and temperatures have sometimes climbed to the 90's. Elderly visitors or visitors with medical conditions should be alert to possible spikes in temperature, and take necessary precautions. Reserving a hotel room with air conditioning is one of them. July is one of the rainiest seasons of the month, and erratic thunderstorms and heavy showers are common. Pack a reliable umbrella in case one of these surprises you during a stroll or picnic. Bring both closed-toed and open-toed shoes. On hot days or day trip excursions you'll appreciate the open-toed pair, but you'll need a good, comfortable pair of walking shoes too, especially since visits to Paris usually involve lots of strolling-- not to mention those maddening metro tunnels and stairs. Pack a hat or visor and other sun gear for sunny days when you wish to spend time lounging in one of Paris' best parks and gardens. Start by comparing travel packages, then lock in a good deal for your July sojourn by visiting sites like TripAdvisor (book direct). Finally, if you're looking for accommodations that match your needs and budget, you can read reviews, find deals, and compare prices on hundreds of hotels at Trip Advisor.